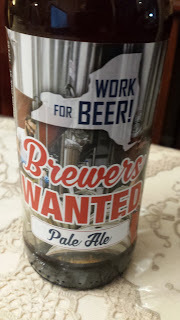 This week's Sunday Night Suds looks at Shmaltz Brewery's Brewers Wanted Pale Ale. In 2015, the number of U.S. breweries grew to 4,000 for the first time since the 1870s and New York State now has 238 breweries and counting. Now, more than ever, we need more passionate men and women willing to learn the craft of brewing. Shmaltz Brewing teamed up with Schenectady County Community College (SCCC), the Greater Capital Region Workforce Development Boards and fellow New York State breweries to start our first regional Brewers Training Program. A portion of the proceeds from BREWERS WANTED will help train new brewers through this program and help support SCCC’s efforts to create an Associates Degree in Brewing. The beer poured a dark gold and had nice lacing and strong carbonation which lasted for more than an hour after the pour. There is a good amount of citrus and hop bite and the beer is clean and refreshing. I unintentionally had some with my daughter's mocha cake and to my absolute surprise, the flavors worked nicely together. If you find this brew and have a positive pairing experience, post it in the comments below. Shmaltz Brewers Wanted Pale Ale is under the Kosher Supervision of the KSA, as are many, if not all of the Shmaltz products. To see what the experts on Beer Advocate think about the brew, please follow this link www.beeradvocate.com/beer/profile/262/214845. Important Disclaimer - If you are reading this post more than six months after it was written, please note that it is possible that the product is no longer still certified kosher. To verify that the product is still certified kosher, please click on the kosher beers list link on the top left corner of the blog.